Users can come into possession of a computer on which is installed a version of Ubuntu that is no longer supported. In cases where the next version of Ubuntu is supported, the user may upgrade to a supported version. However, in the case where the currently installed and the next version is also no longer supported, the user cannot update. In either case, we need to handle these cases more elegantly. 1. Users should be apprised of the fact that their OS is not supported anymore and will not receive updates. 2. Users should be told their options in clear language about how to resolve the issue. For instance, attempting an upgrade, reinstalling a fresh Ubuntu, or contacting their manufacturer for instructions. 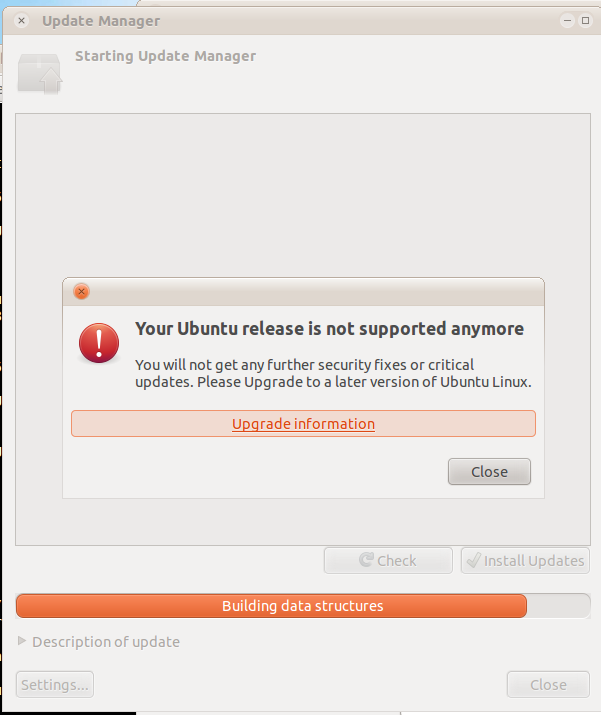 The actual bug here (upgrade from old-releases.ubuntu.com to old-releases.ubuntu.com) works, but we still need to do better when it comes to explaining the user what unsupported means and what options the user has. As a first step we should make sure that users on a unsupported release do not upgrade to a unsupported release without knowing about it). This can happen now on intrepid to jaunty. and what options the user has. I'm happy to adjust the text/wording as needed, this is just a suggestions. have a additional "AlmostEOLReleaseAnnoucement" when the time is close if we want. The next task is to ensure that once the distro becomes EOL there is information on this e.g. via auto popup of update-managerr or the new /usr/lib/update-manager/check-new-release-gtk window with a proper page explaining what is going on. Just for reference, here is what the dialog looks like that we currently show (if the user opens update-manager or if update-manager is auto-opened because there are pending updates). ?field.comment=Just for reference, here is what the dialog looks like that we currently show (if the user opens update-manager or if update-manager is auto-opened because there are pending updates). I added code in natty now that will automatically detect if the release is EOL and write it to motd (for servers) and popup a window that contains upgrade instructions plus a (brief) explaination that the current release is EOL. Its similar to the "screenshot of u-m running on a EOL system" and we should point to a new page explaining about EOL and linking to upgrade instructions. <cjwatson> mvo: what more is needed to close bug 671016? just getting the new page written? <mvo> cjwatson: yes, the page is missing, a bit more testing and then it should be done. This would be the page that the user see if he/she clicks on "more information" in the dialog. Feedback/corrections welcome, when we are happy with this it should move to help.ubuntu.com. Thanks, Michael. I've made some proofreading-type edits; it seems OK to me now, at least as a starting point. > happy with this it should move to help.ubuntu.com. instead of "support" (professional assistance with the product). Gerry, can your team help with this? the unsupportedness of his system every 48h (this is the interval at which check-release-uprade-gtk is run). (I also updated the EOLchecklist to add this bit). This should cover everything, I close this bug.